Lisa Weiss and her team at Wine Cellars by Lisa are dedicated to the craft of producing the ideal cellar for every collection. Knowledge is half the battle, so today we’re sharing some insights on the impact of temperature on wine, one of the most important things a wine cellar controls. How do we know wine is best stored at cave like temperatures? Without the Spanish Civil War, the Gramona family would never have cemented over the stairways to their caves to hide the wine from looting soldiers — and they never would've discovered, by accident, that wine tastes even better when they age in caves. Thus the ideal temperature and humidity for wine was born. Everything that governs the purpose and function of a wine cellar is based on the science of how wine changes over time. It needs to maintain a certain humidity, to help the corks remain properly sealed and keep the necessary amount of air in the bottles. It needs to be kept dark and out of sunlight, to prevent light and UV rays from striking and dissolving the molecules in the wine that give it its flavor. And it needs to be kept at the right temperature, because the fermenting of alcohol is a chemical reaction which can be dramatically impacted by temperature. Wine is kept in its bottle and cellared for a time after it is made in a process known as “aging.” Though the bottle of wine is technically finished, many a wine expert would argue that aging is the true final step in the production of wine, and it can take years. Over time, ongoing chemical reactions in the wine, between its acids, sugars and phenolic compounds will alter and improve the wine, giving it a less acidic, and sometimes very different taste and feel. Temperature is a key component of this aging process; a higher temperature causing the reactions to happen more quickly. Why, then, isn’t wine left in a high temperature, so that aging can take months or weeks, rather than years? The simple explanation is that among the many chemical reactions taking place, some happen faster than others. So while your wine might achieve a color or feel you like better with higher temperature, it also might become much more acidic than it started off. 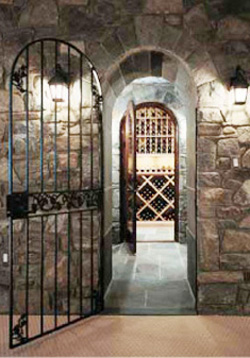 The best way to store your wine is with a well-regulated wine cellar, and your friends here at Wine Cellars by Lisa can build to your specifications. Contact us CONTACT LISA today to start planning your cellar!